Delta Air Lines Inc. said Tuesday it will offer broadband wireless Internet access on its entire domestic mainline fleet by the middle of next year. Several other airlines either offer similar service or plan to, though on a much more limited number of flights. Atlanta-based Delta said Wi-Fi service will be offered for a fee to customers traveling throughout the continental U.S. The nation's No. 3 carrier is partnering with Aircell, an airborne communications provider, to install the network on Delta's domestic fleet of more than 330 aircraft. The system will allow Delta customers traveling with Wi-Fi enabled devices — such as laptops, smartphones and PDAs — to access the Internet while in flight. 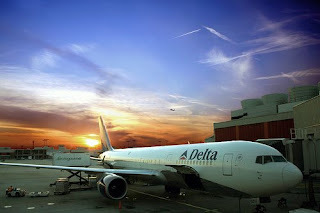 The service will be offered initially on Delta's fleet of 133 MD88/90 aircraft and will expand to the remaining domestic fleet of more than 200 Boeing 737, 757 and 767-300 aircraft during the first half of 2009. It expects to have the technology installed on its entire domestic fleet by next summer.